WOW! THE BEANO NO. 1 SELLS FOR A £12,100 WORLD RECORD! Lot 37 created a sensation in our March 2004 catalogue when it sold for a winning bid of £11,000 (plus 10% buyers’ premium) at the auction’s close on 16th March. 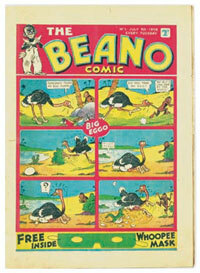 The successful bidder, a businessman from Essex, was on the line from Copenhagen that Tuesday evening to outbid two other determined bidders and claim the Beano comic first issue as his hard-won prize, creating a new world record for a British comic at auction in the process. The comic’s survival itself was just as amazing. 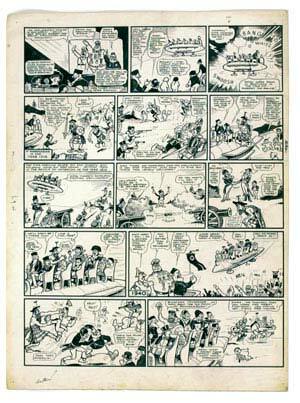 It was collected by a tea-boy working for Beano publishers D C Thomson in Dundee in 1938 when the first issue was launched, less than six months after the phenomenally successful Dandy comic. He wrote on the top margin of the front cover (in pencil, thankfully) “KEEP FIRST ISSUE” and this his family duly did up until late last year when they contacted us and consigned it for auction. Along with it were some “bits and pieces of memorabilia” as the family put it, which were also given to us to “do the best you can”. These made up lot 36 which comprised eight D C Thomson illustrated staff menus celebrating Burns Night, two colour proofs of wartime Beano front covers, a further signed menu from 1962 and a couple of photos of D C Thomson’s founders. Estimated at £100-150, the lot eventually sold for a staggering £853 underlining the extreme rarity of any of this publisher’s ephemera. Not bad for a few bits and pieces! Our run of early Dandy issues, all offered separately, continued and there were substantial differences in final bids between Very Good and Fine graded copies. Dandy comics 23 and 24 went for £97 each in [vg] and issue 24 in [fn-] made £346! 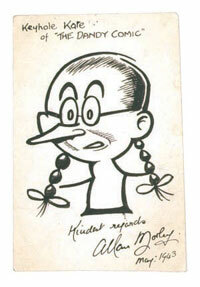 Allan Morley was a faithful servant of the Thomson publishing house for many years illustrating Keyhole Kate, The Magic Lollipops, Freddy The Fearless Fly and Hungry Horace. He, along with Dudley Watkins, was the only artist allowed to sign his work and even then he just penned his initials in the corner. 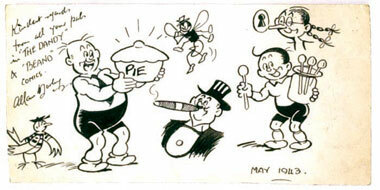 In 1943 he signed and dedicated two postcard-sized sketches of his many characters and it is rare to find any Beano and Dandy artist’s work surfacing outside the artwork of the actual comics. The Keyhole Kate espied £220 and Freddy Fly and his Friends a Fearless £333. 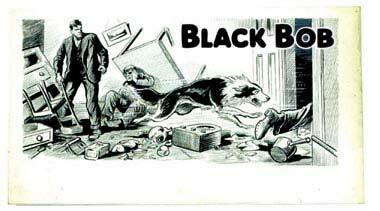 Here was a classic piece of 1940s Beano artwork by the prolific Dudley Watkins. Lord Snooty And His Pals had to go back in time to recruit Robert The Bruce, Wellington and Napoleon for a stand-up fight with Hitler, Goering and Mussolini. No prizes for who won this hilarious contest which was brilliantly illustrated with some darker propaganda overtones by Mr.Watkins. The page went for a mid-estimate £1,375 (£1,512 including premium), a price which may turn out to be an excellent buy in the short term for this key piece. This rare cover artwork in full colour by Korky artist, Jimmy Crighton was bid to £1,300 plus premium and the new owner added this piece to his extensive collection with some satisfaction as it was from The Dandy no. 71 of 1939, the second Easter number. Propaganda war issues of the Beano are always strongly bid and these Very Fine graded copies firmly exceeded their estimates. With Pansy Potter parrying parachuting Nazis, The Wild Boy Of The Woods taking on a German regiment and Lord Snooty selling Mussolini ice-cream, these three issues realised prices between £120-138 each. Jack Prout’s ever faithful Black Bob does not find his way on to the market that often and this beautifully drawn action piece from The Dandy issue 551 of 1952 realised £228. We look forward to a further artwork being consigned to our next catalogue in May. As Beano and Dandy comics from the 1950s and early 60s command £4-8 each in mid grades, those two other stalwarts, Topper and Beezer have also risen to prominence in the last few years. Our March catalogue contained around six hundred issues in low to mid grades (They are difficult to find in better condition due to their broadsheet format) and at £2-3 a copy they were snapped up in short order. Our Fifties section also offered first issues of Beezer and Topper comics and they realised £240 each in [vg] grades; a few years ago you could find similar copies for under £100 each. 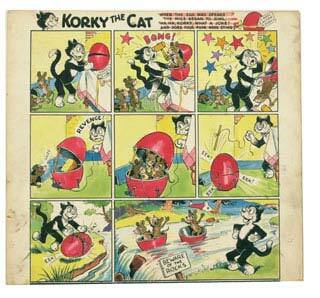 Express Weekly, often thought of as an Eagle comic clone, but much rarer nowadays, was featured in two lots. The 1958 complete year of 52 loose issues were bid over £4 per copy and a mixture of 1957/9 years made the same. Early Commando Picture Libraries are still encouraging lively bidding and issues one, two and three in mid grades commanded £338, £121 and £97 respectively. Viz Comic, that late Seventies organ of tasteful humour, continues to spark fierce bidding amongst our customers. A No. 1 second printing went stratospheric at £425, as did a Very Fine grade No. 3 at £440. High tags for Fat Slags. Superman #11 [vg+] had no major defects and flew to £366 which was £100 over guide for this classic “unchained” cover. We offered The Batman #14 at No Reserve and this low-grade [fr] Penguin Returns copy returned £133. Our Silver Age Amazing Fantasy #15 realised £1,085 for this cents [vg] copy with colour- touched spine. There is a lower grade cents issue of AF #15 consigned to our next catalogue in May. The key Marvel titles of Amazing Spider-Man, X-Men and Fantastic Four all continue to attract plenty of bidding as collectors salt away “second string” pence copies at substantially lower prices than Overstreet Guide. This has been the case for the last ten years as the US collectors and dealers show little interest in buying or handling these UK “export” issues although they were printed at the same time and on the same presses as their cents counterparts. All the more remarkable that only five percent of the print run was UK price printed or stamped for export. It is only when Silver Age comics are graded Very Fine or better that this disparity in value begins to markedly decrease. That’s what makes the UK market so enjoyable and affordable. For all the comic fans out there who actually fancy reading their comics from time to time, that old Thorpe and Porter cover stamp is The Bat Signal, SHAZAM!, and a Metropolis phone-booth all rolled into one.